Oops! Technical difficulties. This post should have appeared before Sailing Along - Curacao to Colombia! 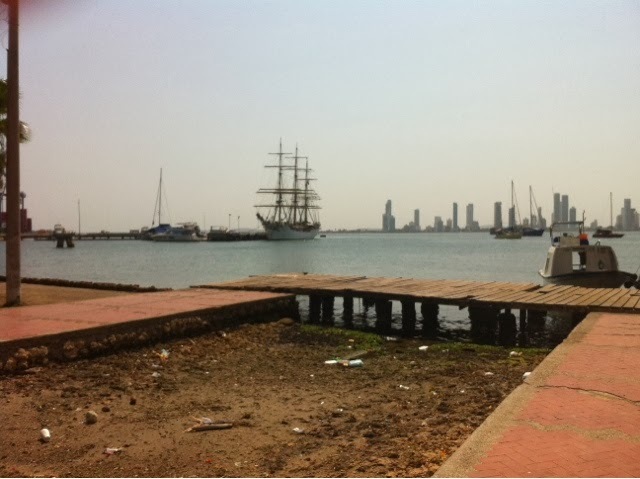 When we arrived in Cartagena I was quite surprised by all the skyscrapers! The pictures I saw at the Port Presentation showed the Old City and I wasn't expecting such a modern port. Cartagena felt quite safe to walk around in, tho I didn't explore too much, just the walk from the ship to the Old City (15 minute walk) and then around in there. 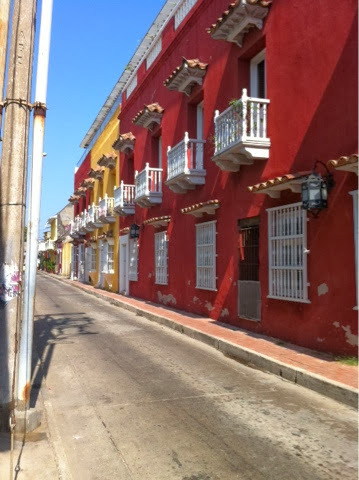 Once I got into the Old City Cartagena was what I expected fom the pictures I'd seen. Lots of bright colours and colonial (?) architecture. 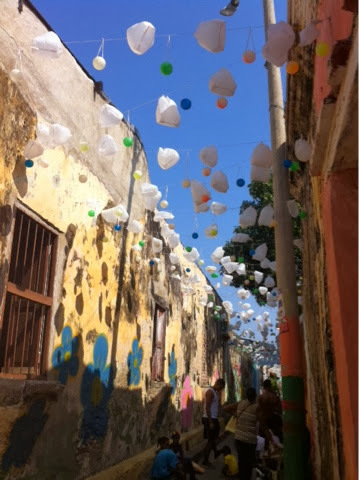 Some of the alleys had bunting type decorations up that gave a festive feel. 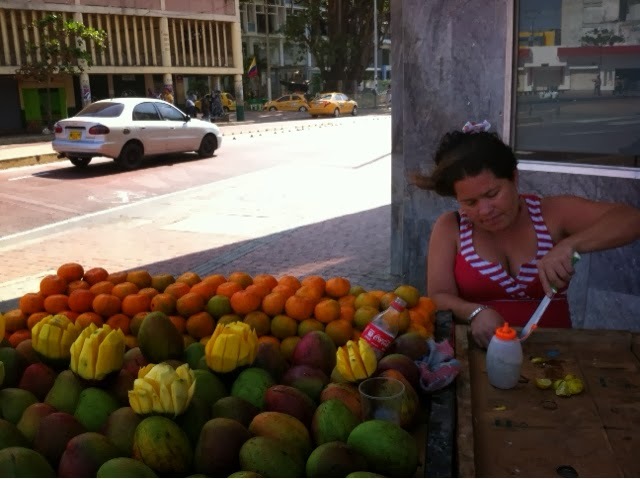 All over there were people selling things: fruit on most corners (mango, watermelon), guys walking around with Thermoses of coffee (I think) and trays of cigarettes and confectionery, carts of produce that were hand pushed or pulled by a small horse, small tables set up with some sort of cell phone business (selling minutes? Selling phones? Fixing phones? ), sheets covering bits of sidewalk with hats, shoes, art and more for sale. Coming from a culture where bigger is so often sold as better it was refreshing to be in a culture where this is not true! 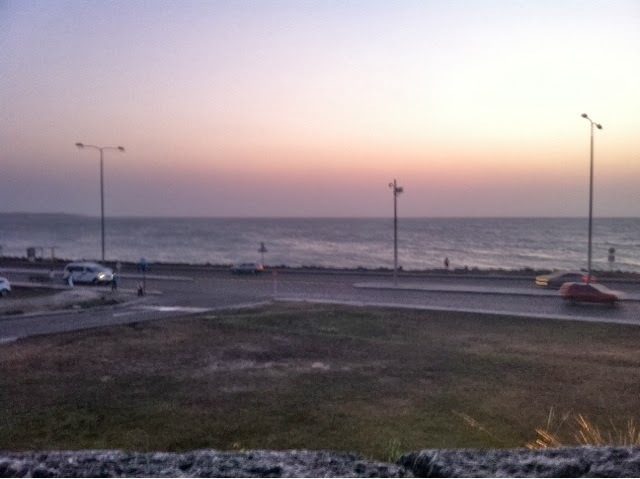 One night the crew and teaching staff went out for dinner together. This doesn't happen often with the different schedules everyone has. As it was two of the maritime crew couldn't come as they were on duty and two of the teachers had to leave after drinks to be there for the students. But impressively both Jess and I were able to go! I made dinner and put it out before changing and heading out to join the others. 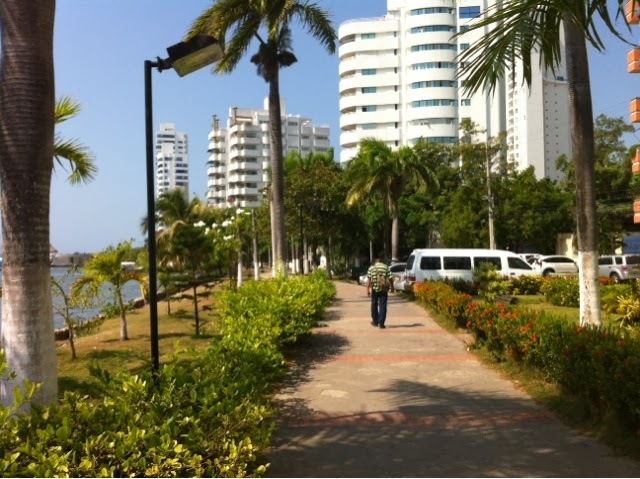 Cartagena is the first place we've visited where the majority of people do not speak English. It makes for interesting communication. When I was looking for stamps I kept showing people my post cards and pointing to the spot a stamp would go. Most people seemed to think I wanted to know where the building in the picture on the postcard was and happily gave me directions by pointing me in the right direction. In the end I had a student find me stamps and then began the chore of finding a mailbox. That never happened but I was able to leave them with a friend of a crew mate who lives in Cartagena so I hope they arrive. Another interesting story, I was wanting to buy a shirt in a store and found one I liked OK and then one I liked better. For some reason the salesperson helping me didn't want to sell me the one I really wanted. Finally he got a calculator and showed me the first one I picked was about half the price of the second. I eventually managed to convince him I really wanted the more expensive shirt - who would've guessed I'd have to talk a salesperson in to upselling!